The Ibanez Tube Screamer came at the right time. In the late 1970s it began to dawn on guitarists that solid-state amplifiers were not all they'd been hyped up to be. Sure, they were lighter in weight and less prone to breakdowns and overheating than valve amps... that was all gravy. The only problem was if you wanted a bit of amp-generated filth, these transistor-loaded buggers simply sucked the big one. Ironically, what frustrated guitarists needed was something that could help a solid-state waste-of-space sound like a valve classic. Relief came in the shape of a puke-green overdrive stompbox called the TS808 Tube Screamer. Produced for Ibanez by Japanese company Nisshin (which still markets its own version under the Maxon brand name), the first-generation Tube Screamer ascended to iconic status when the late Texan blues guitarist Stevie Ray Vaughan made a TS808 an essential component of his signal chain. "The effect of the stompbox's midrange punch on a set of sizzling valves is something every guitarist has to experience"
As SRV knew, a Tube Screamer actually performed at its best pushing the front end of a valve amp. The effect of the stompbox's midrange punch on a set of sizzling valves is something every guitarist has to experience. A Tube Screamer is not a high-gain pedal, and you'll appreciate how well it maintains the tonal integrity of your guitar. It's this tonal transparency that boutique manufacturers attempt to capture in pedals like the much hyped Klon Centaur. The original Ibanez Top Ten Series TS808 Tube Screamer was launched in 1979 with the tone geek's favourite JRC 4558D chip nestled inside. It was replaced in 1982 by the equally highly prized 9 Series TS9 Tube Screamer, which generally ran a Toshiba TA75558 chip. 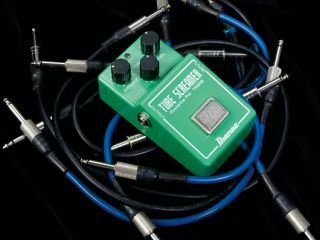 By the early 90s, demand and prices for original models exploded and Ibanez persuaded Nisshin to release a faithful reissue of the second generation TS9 Tube Screamer. It took until 2002 for the TS808 to be reanimated. By that point, Ibanez began manufacturing its pedals in-house. Not all Tube Screamers are created equal. The Taiwanese-made TS10 model that ran from 1986 to 1993, the plastic TS5 Soundtank ('91 to '98) and the later Chinese-made TS7 ToneLok ('00 to '10) are not considered worthy of their iconic model designation. As SRV, Kenny Wayne Shepherd and The Edge of U2 will tell you, only an original or reissue TS808 and TS9 Tube Screamer will do.